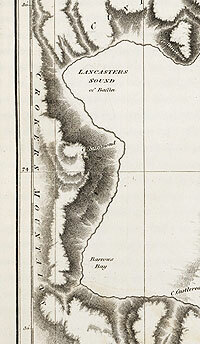 A Voyage of Discovery, Made under the Orders of the Admiralty, in His Majesty’s Ships Isabella and Alexander, for the Purpose of Exploring Baffin’s Bay, and Inquiring into the Probability of a North-West Passage. London: John Murray, 1819. “Red snow” along cliffs in Greenland, from John Ross, A Voyage of Discovery, 1819. 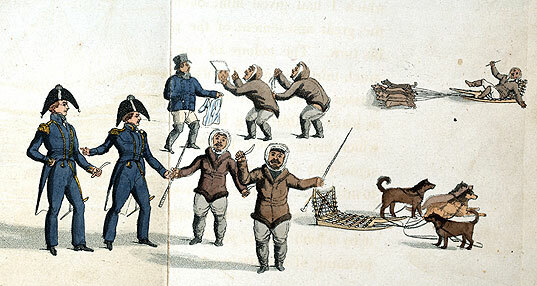 Greeting the “Arctic Highlanders” (Inughuit) in Greenland (detail), from John Ross, A Voyage of Discovery, 1819. John Ross, A Voyage of Discovery, 1819. 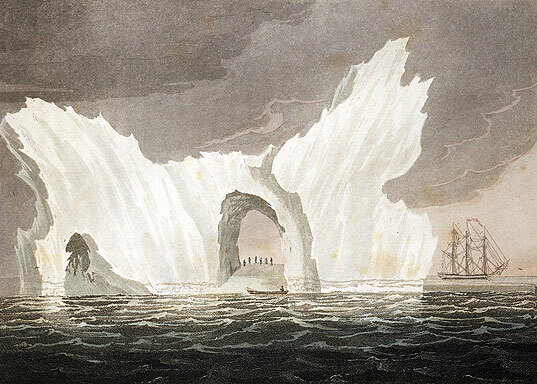 In 1818, John Barrow, Second Secretary of the Admiralty, sent four ships to the Arctic on two separate expeditions. One was to explore the east coast of Greenland, seeking an avenue to the North Pole. The other was to sail up Greenland’s west coast, into Baffin Bay, to see if a Northwest Passage lay in that direction. John Ross was chosen to lead the Baffin Bay voyage, in HMS Isabella and Alexander. Ross confirmed the existence of Baffin Bay (which had not been entered since Baffin and Bylot discovered it in 1616! ), and he examined each of the three sounds leading off the Bay: Smith to the far north, Jones a little further south, and Lancaster Sound just above Baffin Island. Ross entered Lancaster Sound but then turned around, claiming that the Sound ended in a mountain range and he could go no further. He named the range the Croker Mountains, after the First Secretary of the Admiralty, who was no doubt none too pleased when another expedition sailed right through his mountains the very next year. Ross’s mistake was unfortunate, because there were a number of laudable features of his short voyage. He made enthusiastic contact with the Inughuit natives of Northern Greenland; he dredged up sea life from the bottom of Baffin Bay with a deep-sea clam of his own invention; he even brought back some “red snow” that he had seen on the Greenland shores, which would inaugurate a debate as to whether the snow was colored by algae or by “animalcules” (it would turn out to be algae). In spite of these achievements, Barrow never forgave Ross for his failure to explore Lancaster Sound, and Ross would never get another naval command.